"Toddler tantrums are as inevitable as death, taxes, and vomit down your back." I received this free for review from Netgalley. At first I was going to say this book is a pure humor source - it IS funny - but then I thought, well, it also possesses more honest, common sense advice than some of the horrible pregnancy and parenting books on the market. Seriously, some of those are so unrealistic they may as well be used as toilet paper instead. This book indulges in humor, anecdotes, cutesy drawings, dividing the illogicality of childhood behavior with mathematics and physics, but also gives good advice because it's what people can actually expect. It's certainly not all roses and compromise. As example, the authors point out getting a child to eat food the proper way, first by saying how new moms will dream of their gourmet, health food cooking through the years, to possibly have to do shortcuts in the future as life proves uncontrollable. In addition to this there's the frustration children show when it comes to food - fun made-up (I think made-up?) surveys on kids with french fry proportion versus other veggies, refusing to try foods because they're a)weird, b)different, c) they suddenly don't like them anymore, or d)plenty of other reasons that don't make sense to poor parents. "Still, our methodical research shows that you may relax and enjoy the ride once you realize that parenthood is designed to drive you completely crazy." It doesn't give parenting advice but in a humorous way shows different approaches parents take and how life kind of slaps that away no matter what. Children are fun monsters, and this book is a good one for new parents to read as it really is realistic buried in all that humor, and perfect for those who have experienced it already, who like to look back and laugh while commiserating. I think my favorite part was the section which detailed the types of moms out there, with each category breaking it down further. Fun stuff and some of it I can identify with. Such as: "Hands-On Mom is more active during the day, while Perfection Mom is nocturnal, preferring to stalk Pinterest boards late into the night." All art is vector and graphic type, and thankfully the author is generous with it. We get cutesy art of kids being their messy selves and plenty of charts with options on how to proceed; they get an A + in art creativity for the book. Besides the art there are some multiple choice quizzes with clever answers. I do wish the author would have covered the older years more, this is mainly for baby, toddler, and elementary school age. She does discuss the older stages in general terms, but I'd have liked to see more humor on teenager moodiness, middle school boy game addiction, etc. Overall a great book - funny, a wonderful gift for new parents and those who love children, and hope for a future where this will eventually settle down.....some. A little. 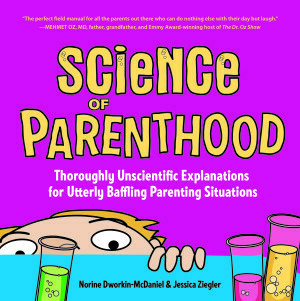 Sign into Goodreads to see if any of your friends have read Science of Parenthood.